Integrating technology into your exhibition stand design should always be done with imagination and purpose, but why? For DMN, technology has transformed exhibitions in recent years and continues to break new ground every year. Why technology has had such an impact is simple, exhibitions are the perfect playground for technology and business to come together. With the continued rise in popularity of experiential events touchable tech, in particular, has become more and more critical in the exhibition space. Touchable tech is what the name suggests a technology that delivers tactile and personal interactions with audiences. All exhibition tech is designed with human interaction in mind, whether it is close RFID scanners or social media walls. However, these tend to involve no direct physical activity. In contrast, touchable tech delivers this direct activity live at the show and lets you create more engaging and immediate experiences and interactions at your stand. At exhibitions there is no limit, all touchable tech has a place if incorporated seamlessly into your stand and concept. The consideration is about what you are trying to achieve with the tech. Are you trying to capture data, deliver memorable brand experiences, demonstrate your product or something else? Connecting your choice of technology to the objectives of the show will help make it both more effective and appealing. The best way to use touchable tech at exhibitions tends to be playfully. This means adding it to your stand as something for people to get involved with and enjoy. You can create games, hands-on demos, or something entirely unexpected. Touchscreens and tablets have become commonplace at exhibitions. Delivering simple, interactive experiences that allow you to tell stories, gather data and sell products. One particularly useful approach is interactive ‘walls’ where people can play games and more. However many exhibitors also choose to have individual stations where people can watch videos, play games and more at their leisure. Virtual Reality (VR) has excellent potential for exhibitions, as the experiences it delivers can take people outside of the stand and venue. 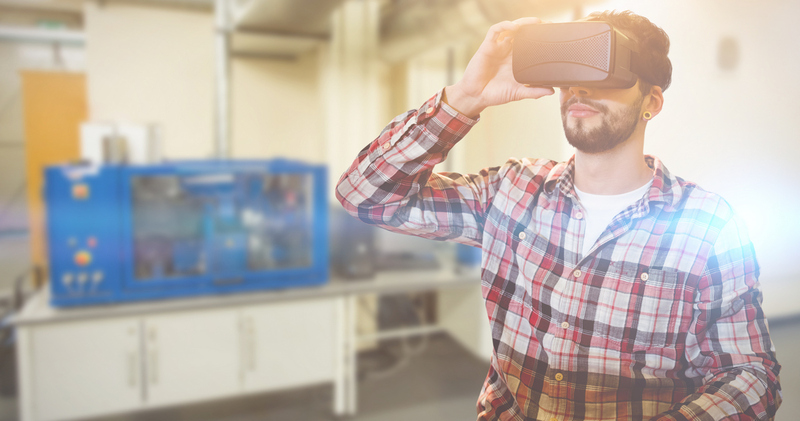 With VR you can tour factories, hold remote conferences or even send audiences to new worlds. Products can be brought to life in fascinating ways through games or being able to see them in use somewhere in the world. VR also works at exhibitions as the kit is purpose-built and doesn’t require as much incorporating into the stands design; making planning for it a little easier. Augmented Reality (AR) is a blend of VR and real-world tech that creates experiences that use your surroundings to bring the technology to life. The best example of this in recent years has been Nintendo’s incredibly popular Pokemon Go game. Interestingly the technology can be used in much the same way at exhibitions. From simple point and play games to Nintendo inspired adventure style experiences. However, it is essential to consider your space and venue when using AR to understand how far you can take your concept. Using robotics at exhibitions can be highly effective. The thing to consider is its relationship to your brand and product. If you have the right concept, you can create highly interactive experiences on any scale. Smaller companies have built DIY robotics sets to demonstrate elements of their products or services. While others have recreated robotic sections of their production lines at the shows to show them working; or doing something menial like giving out beverages. It is down to budget and imagination. Another growing part of touchable tech has been the rise in wearables. Fitbits and Apple watches and others are everywhere, and as exhibitors, you can take advantage of this. Build elements into your stand that allow people to use their wearables to engage. Games or ideas that can connect to wearables help you drive interactivity and collect data. You can also create your own wearables, Snapchat did this with their ‘Spectacles’ to help them drive brand awareness, and it worked. Not everyone can work to these budgets, but there are some more cost-effective options available if you look into it. Another way to achieve touchable tech engagement is to let people use their own tech. Most attendees will have smartphones, so as part of your stand you can create elements or apps that require them to get their smartphones out and use them. The simplest way to create touchable tech experiences on your stand is using your own tech to deliver an experience. Pantone did this at BLE 2017 where they used elements of their color production facility to bring the process to life. For others, you can have your product doing whatever it does best with live demos. For those wanting to go a little further, you can do things like stripping down the products to show inner workings or let people assemble sections of your product themselves and other such approaches. For those wanting a more nostalgic touchable experience consider remote control tech whether it is simple things such as remote control cars, Scalextric tracks or similar. Alternatively, you could use more modern equivalents like drones to help people experience the event in different ways. This type of tech is a simple and cheap way to draw attention from crowds while giving you opportunities to gather data and leads by integrating this with other like tablets to tracks entrants, keep scores and collect emails. The key with any touchable tech at exhibitions is its accessibility. Audiences need to be able to join in quickly and easily, or they will continue around the event. Also, ensure that the tech is noticeable. This doesn’t mean it has to dominate your stand, but you have to give it good sightlines for traffic even at peak times to ensure interest. So ensure you understand typical routes around the venue when planning your stand to make sure it achieves this. This can be simple for tech likes screens but becomes more challenging for more personalised tech like VR. Finally, whatever tech you use, keep it on brand. Your stand will have a concept, and this technology and how you are using it should help further that concept. It should deliver key messages about your product or service in an engaging way. By doing this, you create memorable experiences for audiences but also lasting brand engagements. Mark Lamont has worked at DMN 23 years and started out as a Project Manager and now he is an Managing Director in DMN Design Build. He specializing in modular exhibition stands, event production, exhibition services and much more. He has run projects all over the world and ensures on time and on budget practice is a prerequisite for all projects.